* Got a White Chocolate Mocha for some energy for the night... needed it because it is WRAPPING TIME!!! * The Hubs had to work, so I woke up with 4 dog faces waiting for me to get up to keep them company. Actually had one dog WAKE me up. Bruno was sitting next to me, looking at me right in my face, taking his paw & hitting my face.... who taught him THAT? 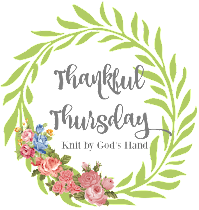 * Wrapping some more... went through my stash to find boxes & came across these little cuties that I picked up last year from Hobby Lobby.... 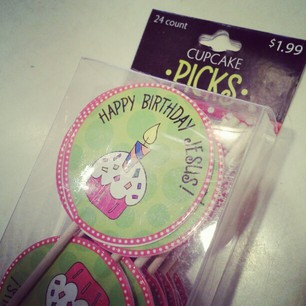 I cant wait to make some cupcakes now. * It was so warm - I had to take advantage of it - went for my first 5K run in awhile. My back did decent. Even got sun on my legs. * Got home & got caught up in the movie "Ransom" with Mel Gibson & Renee Russo... man, that movie is crazy intense. * Dinner time. 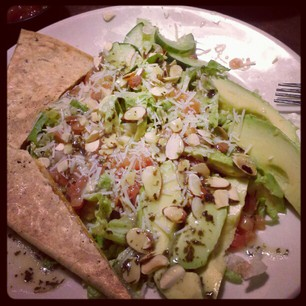 I got an Avacado Salad. It's supposed to have chicken on it. No meat for me - so I ask them to just put the chicken on the side... in a to-go box. Makes it nice to take home for the dogs.... they're happy. * Christmas shopping at 8:00pm is pretty nice. Target was pretty empty. I guess all the cool people are doing better things on a Saturday night. Fine with me - we felt like we had the whole store to ourselves. * ELF!!!!!!!!!!!!!!!!! First "Elf" viewing of the year... & I still laugh like its my first time seeing it! * Church time... It made my heart smile to see 3 young ladies from our youth group get up & sing "Where are you Christmas?" ... like angels singing... love these girls!!! * Went to lunch with Ricky & Chasity & then he headed out skating while we ladies went to the movies... BREAKING DAWN!!! Finally!!!! * The little girl that played the REAL Renesmee (not the computer animated scary girl)... she is such a beautiful child! No wonder they picked her for the part of Edward's child! * The big surprise ending? I gasped! I knew something was coming that wasnt in the book (I keep hearing everyone say that...) but I had no idea it would be THAT intense. I said the following things, "I'm going to get sick"... "THAT'S NOT IN THE BOOK!" ... "I'm getting dizzy".... "I'm REALLY starting to freak out now!!!!! "....but the best of it was in the end, where a lady behind us yelled, "WHAT THE F&#(?" ...she seriously did! 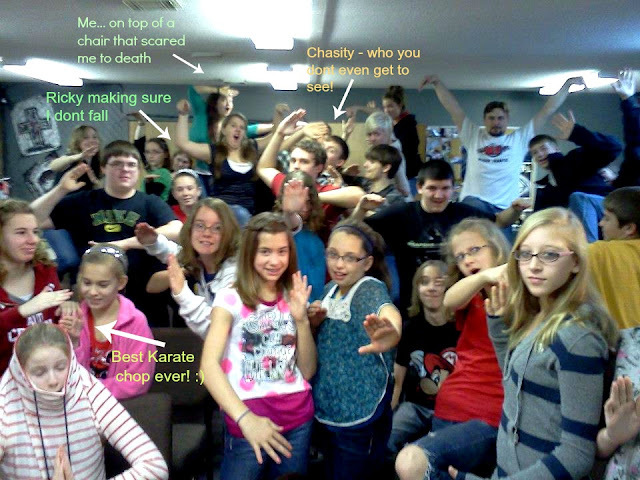 Chasity & I just started laughing. I have to say, it was nice tension reliever. * I left the theater with a SPLITTING headache!!!! * We stopped at a local health food store to get some Raw Local Honey... they have these vegan pies that Ricky & I usually get. We picked up two, I paid - got in the car & looked at the receipt. They were $7.95 a piece!!!! WHAT????? It cost more for these pies then to go to the movies. .... & they were HORRIBLE... I was sick after I ate it. That was disappointing! * Home for the "Once Upon a Time" Winter Finale.... Oh Captain Hook... why do you have to be so good looking, but so bad... but so kind underneath it all? Now - onto another great week!!!! You're exhausted? Whew...so am I after reading about all you did! Where do you find the energy? Yeah...those Sister Wives chicks just can't be happy here lately, can they? But...I continue to tune in every week. Abby and I watched "Elf" on Saturday night. That movie never fails to put me in the Christmas spirit! 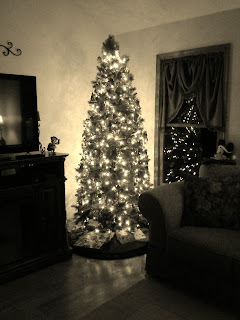 If that B/W shot is any indication of how pretty your tree really is...I can't wait to see it in color! You sure do love your Starbucks! I haven't seen Breaking Dawn part 2 yet. I heard it was different than the book. 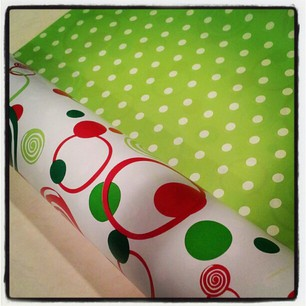 I love that wrapping paper! Can't wait to see your tree in color! I got our gifts all wrapped ... and then found one of that one of them is a duplicate, so I had to unwrap it and order a replacement. Target wasn't crowded here at 8:00 this morning ... if I could guarantee stores would be like that, I might actually do my shopping in stores rather than online. No, I wouldn't. ha! I laughed at the end of your post, when you said that about the sister wives! As busy as you were this weekend, you could have used a couple of "helpers"
Love the wrapping paper, although I confess I am all ov the gift bags! I am a horrible wrapper! 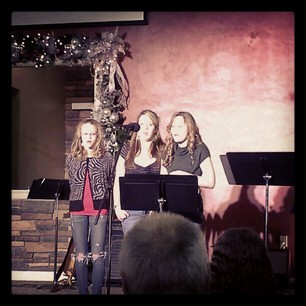 Love the girls singing at church! And....how sweet a husband is that meeting you to load the groceries!? Just reading about your weekend makes me tired. Love your Christmas wrap. Haven't seen the movie, but then I haven't seen any but the first one. Didn't read the books either. I just couldn't get into the first one. I tried. For some reason, I didn't watch Once Upon a Time this season. In fact, I missed the last 2 or 3 from Season 1. Guess I really should catch up on in one of these days. Love my Once Upon a Time!!! Good always wins.